Beidh na sár-cheoltóirí Oisín Mac Diarmada agus Séamus ó Beaglaioch le Méabh Ní Bheaglaioch agus Matt Grifffin ag seinnt i nDún Mhuire, ar an Déardaoin, 20 Samhain, 2014. Tá an-aithne ar Oísin Mac Diarmada ón ghrúpa “Téada” a bhunaigh se féin 2002 agus a sheinn san Aonach cúpla uair. Thosaigh Oisín ar an bhfidil agus é ina lead óg i gCo. An Chláir. Lean sé air nuair a d’aistrigh sé go Co. Shligigh áit a músclaíodh a shuim i stíl cheol na háite. Tá Oisín i gceannas ar SCT scéim scrúdaithe ag Comhaltas Ceoltóirí Éireann. Cúpla bliain ó shin thosaigh Oisín ag taisteal le Séamus Ó Beaglaíoch. Ó Ghaeltacht Chiarraí do Shéamus a bhíonn ag seinnt ar an mbosca cheoil in Éirinn, i Meiriceá agus timpeall an domhain le fada. Dár ndóigh is stíl Chiarraí atá aige idir amhráin agus cheol. Tugadh an omós do Shéamus le deanaí nuair a chraol TG4 clár ar leith ag an Oireachtas i gCill Áirne dó. Iníon le Séamus is ea Méabh Ní Bheaglaíoch a bheidh ag seinnt leo i nDún Mhuire agus Matt Griffin ar an ngiotár. Beidh soláistí ar fail ar an oíche. Bígí ann gan teip! We welcome Oisín Mac Diarmada and Séamus Begley with Méabh Begley and Matt Griffin to Dún Mhuire on Thursday, 20 November. Seamus Begley accordion player from West Kerry, is a very well known accordion player from his television appearances down the years and we enjoyed listening to himself and Oisin Mac Diarmada, fiddleplayer some time ago in Dún Mhuire. Oisín has also performed at home and abroad with Seamus in the past couple of years and we expect to have a great night of music and entertainment. 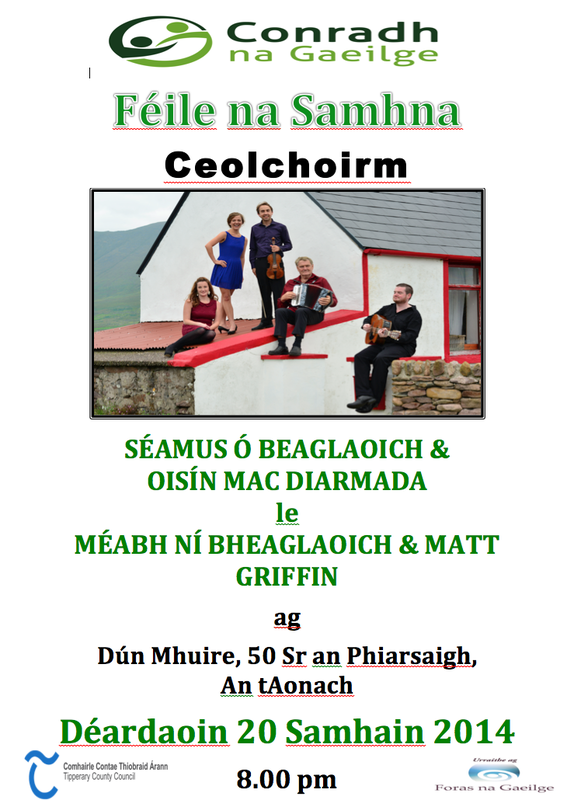 Seamus’s daughter Méabh with Matt Griffin will accompany Oisín and Séamus. 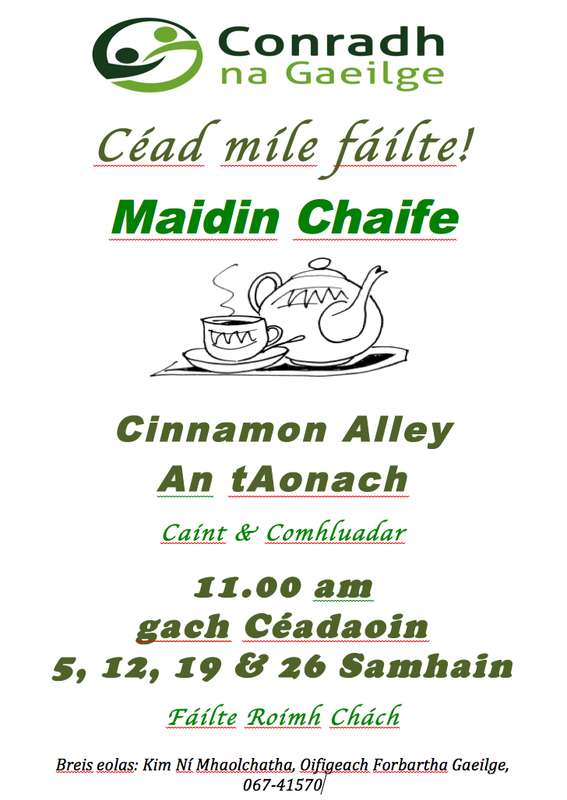 Refreshments will be served so come along and enjoy the conviviality.